I love old, historical maps. 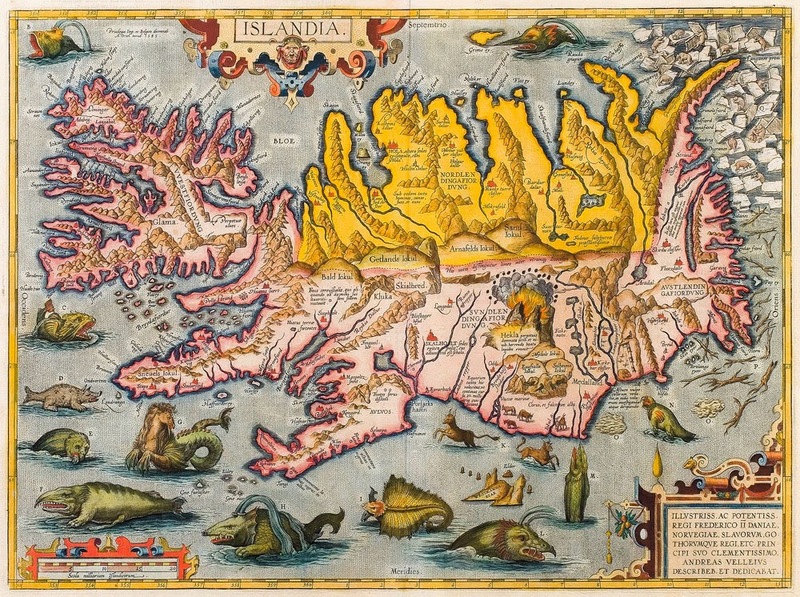 Before my husband and I went to Iceland last summer, I found a print of a map created by Abraham Ortelius, a 16th Century Flemish geographer and cartographer. 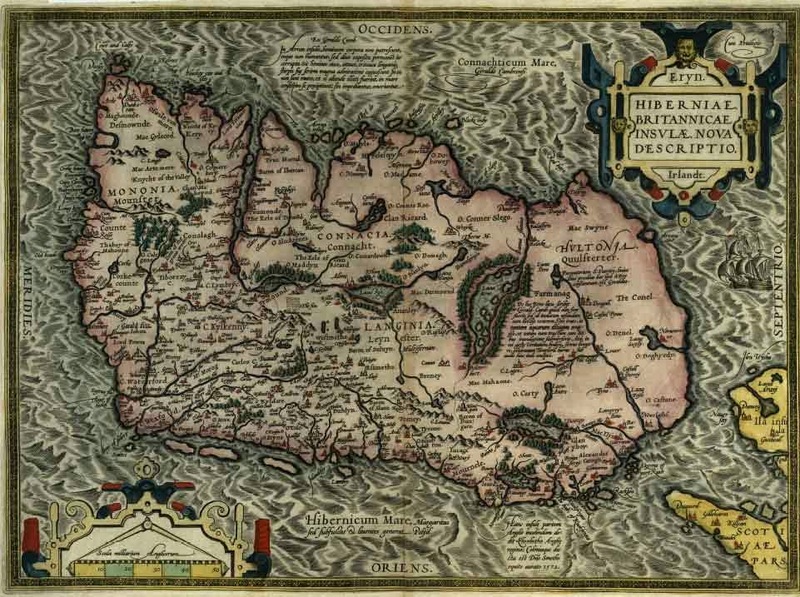 (Ortelius is credited with creating the first true atlas.) I bought it and had it framed, although - of course - I also found a copy in Iceland that I transported home. I personally like the sea creatures and monsters included around the edges. I suppose if anyone was likely to control the sea monsters, it would be the Vikings. One of the reasons I like old maps so much is because I like seeing how spaces have changed; how the map is drawn and positioned, what is included, shows me how countries and their people are interpreted. (Why Ireland is depicted as sideways is curious. I can attest that many Irish people are sideways - although perhaps that just includes my relatives - but it's an oddity nevertheless.) I've been to Ireland more than any other European country, and I've driven around many places throughout the country, so I like trying to see how familiar places have been identified. With more recent European travels though - Ireland aside - I like to plan my trips, with the understanding that plans might change, that places I'd wanted to visit and see might not happen, or I might see something else to see that I hadn't planned on. Much of my own mapping experiences are based on both historically and contemporarily important sites, as well as being based on geography. I map out what I want to see and how I'm going to get there, and the geography affects how I get there. Depending on how long I'm going to be visiting a place, for example, and how much of the area I'd like to see will affect if I rent a car (as I did in Iceland), or if I make use of public transportation (as I've done in Stockholm, Helsinki, and Dublin). My most recent trip was the 19-day trip my husband and I took to Iceland, and for more than half that time we drove around the exterior of the country. We could have taken buses; we could have backpacked or rented bicycles. The former had no bathrooms; we're not interested in backpacking or bicycling. Driving was the most practical option because it gave us the freedom to stop to explore, to eat, and to admire the sheep that decided to run in front of us one morning (we wondered if the rental car company offered sheep insurance). Driving also allowed us to explore historical and natural sites – like Þingvellir National Park or a whalewatching tour – that we might not have seen otherwise, had we stayed on a tour bus, and it gave us the freedom to stay as long or as little as we liked. This meant, though, that our mapping included walking and a boat - places that were inaccessible to cars. Many of our mapping experiences - because my husband is the person with whom I travel most - are also based on restaurants and museums. 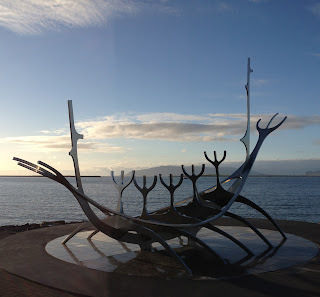 For our last week or so in Iceland, we stayed in Reykjavik, a small enough city in which we didn't do much driving. We rented a small room close to an area that was close to the waterfront, shops, restaurants, and museums, so we were able to walk. We were able to walk to the Sun Voyager. Our mapping neither especially includes nor excludes people or political systems - although, again, if there is an aspect that is historically relevant, we would do our best to see it. My husband and I both have special interests in history (in case you might not have been able to tell), but our politics are not exactly in alignment, so it's not an aspect of travel we go out of our way to see. We did, however, make an exception to see Alþingi - the Parliament House in Reykjavik - where one can view meetings from the public gallery. This was really cool to see, although we had no clue what was being said.